Although this website spotlights Charles Edison and Charles Edison Fund, I would be remiss if I did not discuss Charles Edison’s Father, Thomas Alva Edison. Imagine a world without the genius of Thomas Alva Edison’s inventions: no electric light bulb, no street lights or power grid, no phonograph, no motion picture projector. Electricity and the telephone would be more primitive, Edison’s gifts to everyday life are so ingrained, I, for one, take them for granted. It is almost impossible to imagine the world without the contributions of the most prolific inventor of all time. Many in fact say that Thomas Alva Edison invented the twentieth century. Now that the 21st Century is underway, I have been thinking about what lessons and values we will take into the future. Our scientific and technological accomplishments are unprecedented. The physical universe is so much more precisely understood. Mysteries of the human brain, genetics and molecular biology are uncovered everyday. Technology has opened previously impossible pathways to a global economy. As an example, your smart phone is based upon three industries that Edison created (i.e.) music (phonograph), light (lightbulb) and movies (motion picture camera). These monumental advances bring me to an even greater appreciation of Edison’s immense contributions. He applied his genius and creativity to inventions that benefit and improve the quality of everyday lives of ordinary people. He demystified genius by explaining it as hard work and stick-to-itiveness. In fact he said, “genius is one percent inspiration and 99% perspiration.” This man’s accomplishments, values and attitudes are a role model for future Edisons. Thomas Edison was a humanitarian who made enormous contributions to the world. If asked seventy-five years ago who was the most famous person in the world, on would say Thomas Edison. What follows on this website, is a tribute to Thomas Alva Edison the inventor, brought to you by his son’s Foundations, Charles Edison Fund. Charles Edison, was a substantial person in his own right, a statesman and public servant and role model and to all those who want to make a difference. 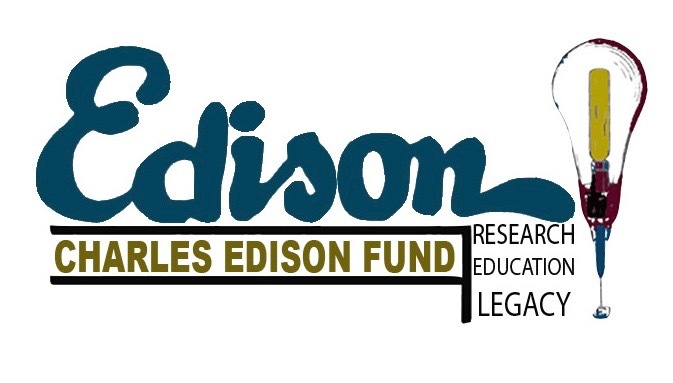 Charles Edison created his non-profit fund to support the legacy of his father Thomas Edison, and to promote education, specifically careers in science and technology. The programs which focus on the legacy of Charles Edison, medical research and education at the grammar, high, college and graduate school levels, are the best in the country. Charles Edison was the son of Thomas Edison, the famous inventor and entrepreneur. Charles was a businessman and philanthropist and in 1948 established the Charles Edison Fund ("Fund"). The Fund was created to maintain the legacy of his father, Thomas Edison, and to meet his own philanthropic goals in good and bad economic times. The Fund also engages in licensing the Edison Intellectual property, including the name, image, quotes and artifacts of Thomas Edison ("Edison IP"). The extra revenues generated support educational programs run by its sister foundation, Edison Innovation Foundation. Copyright © 2017 Charles Edison Fund. All rights reserved.